From the Office of the Prime Minister: The media and by extension the national community are hereby notified that responsibilities for matters relating to Children�s Authority, Child Development, Children�s Homes, Children with special needs, Community Residences, Orphanages and Gender Affairs have been removed from the purview of the Ministry of Social Development and Family Services and assigned to the Office of the Prime Minister. In this regard, Minister of State in the Office of the Prime Minister Mrs. Ayanna Webster-Roy�s portfolio will be expanded to include these responsibilities, which were previously held by Mrs. Cherrie-Ann Crichlow-Cockburn. His Excellency Anthony Thomas Aquinas Carmona has been duly advised of the adjustment in accordance with Section 79(1) of the Constitution of the Republic of Trinidad and Tobago. Source: Amendment of Ministerial Responsibilities | Trinidad and Tobago Government News This change became effective from Wednesday 11th November, 2015. 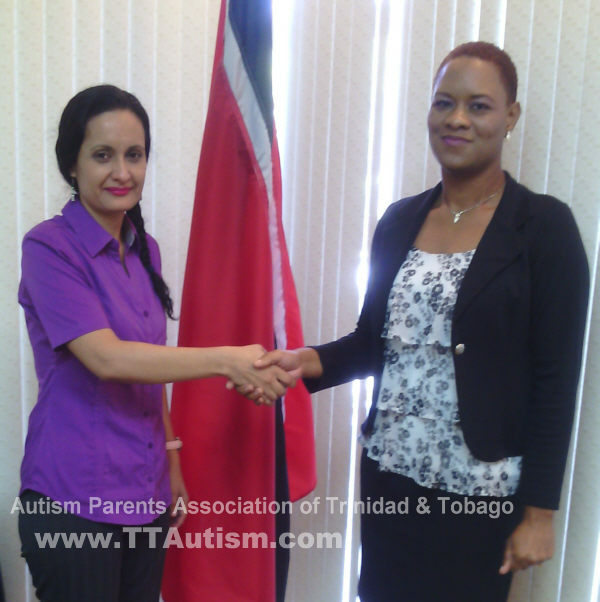 Today, Friday, 13th November, 2015, the President of APATT, Maria Borde met with the Honourable Minister Ayanna Webster-Roy at her office to discuss the urgency of APATT's mission to see that ALL children on the Autism Spectrum receive FREE public education from qualified special needs teachers and therapy by trained specialists in Autism. The meeting was cordial and productive. The Hon. Minister Ayanna Webster-Roy also saw video clips showing the extent of low functioning Autism and the need for these children to receive help as well as those who are capable of being integrated with assistance.